AWE Tuning Performance Intercoolers - Dezod Motorsports Inc - Home of the automotive performance enthusiast since 2002. Extensive real world testing has resulted in AWE Tuning as the undisputed champion of intercooler design. 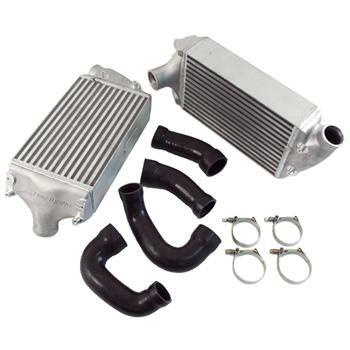 Intercooler design consists of more than just finding the largest core that will fit on the car. Exposed area, number of pressure charge rows, cooling fin count, and end tank geometry are some of the key parameters that need studying when embarking on an intercooler project. As with most of our intercooler development, the use of sophisticated Computational Fluid Dynamics (CFD) software allowed us to study airflow and maximize our approach to lowering intake air temps even before we hit our chassis dynamometer. Our end tanks go through multiple design evolutions. By carefully choosing our cast aluminum end tank shape, along with the integration of a directional baffle, we were able to drop intake air temperatures, while also reducing restriction by half! Not only does that result in an additional horsepower, it also means completely stable power under the hottest outside conditions. Temperature drop, pressure drop, and overall core efficiency were logged and calculated through thorough dyno, street, and track testing, in all sorts of ambient conditions. In addition to the superior core and end tank design, the AWE Tuning Performance Intercooler Kits also features 6-ply silicone hoses with gentle curves to prevent bursting under pressure. They are attached to the intake and turbos by stainless steel high force t-bolt clamps. Further, our hoses use a Nomex braiding for superior strength, instead of more common polyester. The very best materials and industry leading engineering separate this kit from all others on the market. AWE Tuning Performance Intercoolers are simply massive in their abilities. Nothing else comes close.